Libya's interim government has set a deadline for militia groups to relinquish control of the country's border crossings by the end of the week. 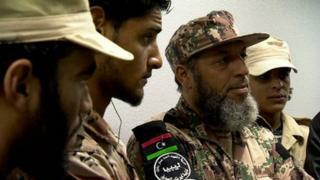 The issue is becoming part of a battle of wills between Libya's politicians and the young men who fought the revolution. "Nearly all of us are from Zintan," says Abdel Hakim Sheibi, one of the commanders in a force of around 1,200 men. He's a broad man wearing combat fatigues and, somewhat incongruously, blue suede boots. He and his men say they are loyal to the interim government. But they are not under its control. Nor are they being paid. "We don't expect anything from the government, even though they've promised to pay us. We're used to them saying one thing and doing another. Even under Gaddafi it was the same." Actually, some of the fighters in Abdel Hakim's brigade do get paid. He himself was once an officer in Col Gaddafi's military. When the revolution broke out last year, he joined the rebels in Zintan. He continues to receive a military salary. Others who once held government jobs are in a similar position: they continue to be paid, even though they no longer work in their old jobs. But this applies to only a handful of Abdel Hakim's men. The rest rely not on the new Libyan state, but on donations from the Zintan brigade to feed themselves and their families. And that it part of the problem. It is a place where modernity and tradition live side by side. Men on horseback share the roads with pickup trucks, some with anti-aircraft guns still welded onto the back. Last weekend, when the BBC visited Zintan, a tent had been erected on the brow of a hill on the outskirts of town. Inside, was the French defence minister, Gerard Longuet. He had come to meet his Libyan counterpart, a Zintani himself, as well as local commanders including Mr Madani. "My desire is to pay homage to the Libyan fighters in the places where the resistance proved to be decisive," he told the BBC. The mood was upbeat, as the dignitaries sat on rugs on the floor eating a traditional dish of lamb stew and mountain truffles. The talk was of co-operation. Not far from where the French defence minister was enjoying his lunch, Saif al-Islam Gaddafi is being held in a secret location. The former Libyan leader's most prominent son is wanted by the International Criminal Court. His captors want him to stand trial in Zintan. Saif al-Islam, Tripoli airport, the banks, the oilfields: these assets are valuable bargaining chips in the new Libya. Come Monday, it's unlikely the Zintanis will be ready to relinquish them.